Delft pottery is one of the most unique types of pottery to have come out of Europe and its striking blue and white design has become truly iconic. Delftware certainly ranks up there in the top collector's items, when it comes to ceramics. The technique can also be referred to as Delft Blue pottery (Delfts Blauw in Dutch). Its inspiration came from examples of blue painted pottery that were brought back from China to the Netherlands by the Dutch East India Company. Delft got its namesake from the small town it originated from in the Netherlands in around the 16th century (the town of Delft is also well known for being the birthplace of famed Dutch artist Johannes Vermeer). Delft was a development on the glaze technique majolica, which has been defined as being ‘an earthenware covered with an opaque tin glaze and decorated before firing’. Majolica was a glaze technique that became most popular in Europe in the 15th century. The difference being Delftware was painted with highly decorative scenes in a distinct blue and white. The content of the scenes varied greatly, but a great source of inspiration was Dutch working life and the work often depicted the country’s famous windmills, fishing boats, and hunting scenes. Scenes from the Spanish Fury (or the Sack of Antwerp), 1583 to 1589 during the Dutch Revolt were also painted onto ceramics works. 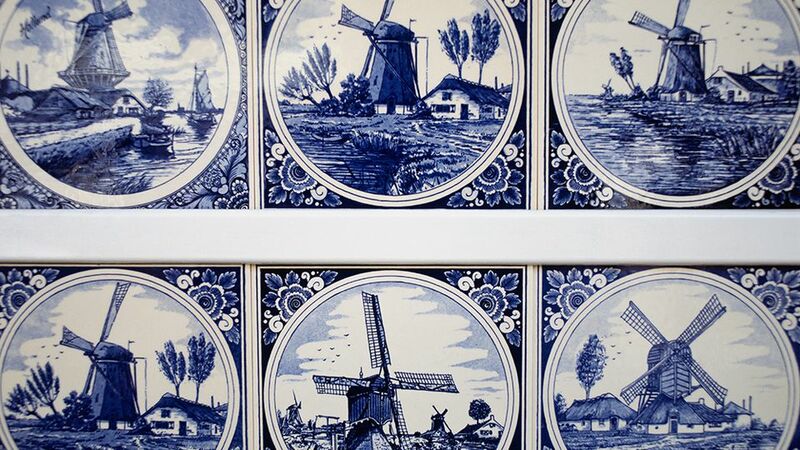 The pieces were commonly plates and vases, but a vast quantity of tiles were also made and used on houses that were built through the 17th and 18th century, many of which can still be seen if you visit Delft today. How Did Delft Potters Create Their Work? Delft is created by the potter’s work being completely covered in a white tin glaze before they paint an intricate design or scene onto the piece. The entire piece is then covered in a clear glaze to seal in the color and create a rich shine. The clay used is sometimes referred to as porcelain, but it's actually usually made from a type of white clay, which had a high content of calcium compounds, kaolin, and quartz. Much of the Delftware was created in large quantities and slip cast, rather than being hand or wheel thrown. To create the scenes they wanted to paint on their earthenware, potters often made stencils, to make sure their designs were perfect. An ancient technique of creating a stencil, which is sometimes still used, was to sketch the design and then make pinpricks in the paper, the paper was held over the ceramic piece and charcoal dust was sprinkled on to it, leaving an outline of the basic sketch on the pottery. From there the potter can see exactly where to create the design and will then finish the entire decoration by hand, using a black paint containing cobalt oxide, which turns to the famous beautiful rich blue color in the kiln. Once finished the whole work will be dipped into a white glaze. Delft polychrome earthenware was developed from the original Delftware and incorporated not just blue and white but a range of colors (often using the primary colors red, yellow and blue). Where Can You Find Delftware Today? Despite its popularity, Delft pottery came close to dying out around the mid-18th century when mass production of pottery began to gain momentum. Luckily for the craft, a ​Dutchman named Joost Thooft bought one of Delft’s most important factories De Koninklijke Porceleyne Fles (known more commonly as Royal Delft), which was struggling at the time, and brought it back to popularity. The factory is still in operation and has been running for over 360 years, it’s also the last of the remaining earthenware factories in the area. Often you would find Delft works with Joost Thooft’s initials marked on the bottom. Another popular producer is the DeWit factory in the Netherlands, which still produces some of the most beautiful hand-painted Delftware created by Dutch artisans, carrying on this rich tradition.